Click the pic for full details. We sold this trike brand new to the seller. With only 80 hours on this trike, Steve, a former general aviation pilot, has redeveloped the 'need for speed' and is sacrificing this gem of a Part 103 ultralight. That’s right, no Sport Pilot bull*%$# on this one. It has been meticulously cared for and always kept indoors with a custom cart available to move the trike in any direction on pneumatic tires. It has never been disassembled. No leaks, no dings, no scratches. It is still in brand new condition. It has a Soft Pack 750 BRS, 447 Rotax engine, Ivo 2-blade prop (tested to perform better than the 3-blade), new extra-wide Legend Fairing with windshield. (We actually designed the new fairings of the Apache & Maverick for Kamron/Northwing a couple years ago. We also generate all of Northwing's assembly drawings.) 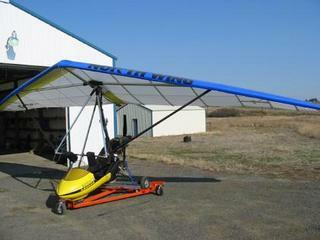 We know Northwing's product very well, and this trike is one of the best 103 ultralights in the industry. The instrumentation is refreshingly basic with a CHT, EGT, Tach/Hobbs and plenty more room on the dash for whatever. The Icom A5 VHF Radio is wired and fused into the dash's power supply. Things must be changing at Comtronics, because this setup sounds pretty good; communications are complete with the helmet, visor, headset & interface cable, and bar-mounted press-to-talk. The neoprene bar mits are lined with sheep skin. It all works perfectly. The only thing I would recommend is an electric start. Steve has already installed the Keywest regulator/rectifier so a battery and a GPL Stater kit for $550 would make it complete. If you're not comfortable doing the conversion, for a small fee we can do it or even supervise you. Training is available year-round with complete ground school, wing tuning & mechanical seminars. We've sold 47 aircraft in the last 3 years, trained over 60 and I have personally owned 11 trikes. Be a responsible & positive pilot and you'll receive our 24/7 support on this trike forever along with club affiliation & invites on all of our cross-country excursions as well.